Last week, I accompanied my colleagues and several refugees to observe the Legislative Council’s (“LegCo”) Panel on Security meeting. 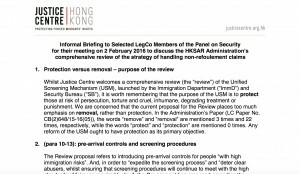 The session was to discuss the Hong Kong Government’s comprehensive review of the strategy of handling non-refoulement claims, including the Unified Screening Mechanism (the government’s screening process for asylum claims, or the “USM”). A comprehensive review of the existing system surely is a good thing. However, the Government’s review actually places a lot of emphasis on the removal – rather than the protection – of refugees in Hong Kong. In response to this, Justice Centre has circulated an informal briefing to selected members of LegCo detailing our concerns. As we walked towards the LegCo complex to attend the session, we warned the refugee observers with us that we did not expect the meeting to be a pleasant one: harsh and vacuous words might be thrown around, and the atmosphere might be hostile. We had good reason to believe this; ever since last June, when the government started displaying a keen interest in people seeking protection in Hong Kong, the political discourse surrounding the issue has largely been negative and misdirected. As we tried to enter the building itself we were informed that the ‘Recognizance Paper’, which is the only form of official ID a refugee has in Hong Kong, is not considered an acceptable identification document for visitors. This was unusual as protection claimants have accompanied us to LegCo on numerous occasions to observe sessions, tour the complex, meet with LegCo members and even to present at a Panel on Security session. It took 30 minutes to resolve this and obtain permission for the refugees to enter. This in itself was worrying; the ability to observe and participate in meetings at LegCo are an important part of our socio-political rights. In other words, LegCo should be accessible to everyone, and this includes people who are seeking protection in Hong Kong. Therefore, it is extremely concerning (and ironic) that they were very nearly prevented from observing an important discussion on their own rights and status. The actual session was very disappointing. A total of 30 minutes were allocated to discuss this important issue that will have a profound impact on people seeking protection in Hong Kong. Throughout the meeting, legislators reiterated the government’s rhetoric that refugees are a nuisance to public order and security. Legislators and government officials discussed withdrawing from the Convention against Torture (that protects not just refugees but also people in Hong Kong), setting up detention camps and removing “fake refugees” speedily in a worryingly callous manner. There was barely any discussion that actually focused on ‘protection’. At no point was there a mention of the implementation of the Committee against Torture’s recent recommendations to Hong Kong. But we must be reminded that they are not just faceless figures. These are ordinary people who just happen to be in extraordinary circumstances; they are student activists who told me if the Umbrella Movement had happened in their countries, it would have been so effective that they would have been given their rights in a day; they are keen learners who told me they were taking Cantonese classes or that they would like to pursue another degree in University; They were once my grandparents, who fled China during the Sino-Japanese war. We need more humanity in the discussion. This is especially so given that the world today is grappling with the worst humanitarian crisis since World War II. To quote my colleague Victoria, “It’s high time we understand that refugee rights are about human rights, and if we erode refugee protection in Hong Kong, we are only shrinking the human rights space here”. 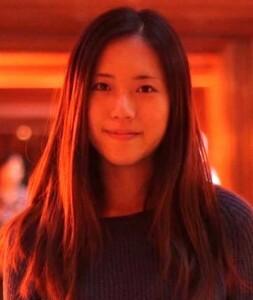 Rachel Li is the Policy Intern at Justice Centre Hong Kong. Refugees have recently made the headlines in Hong Kong’s local newspapers. I work as a caseworker in Justice Centre’s Protection Claimant Services team to help people navigate the Unified Screening Mechanism (or the USM, the government’s screening process for protection). This role has enabled me to see these recent reports by the government and media from the perspective of the people to whom it matters the most – the refugees. While a majority of this attention has heavily focused on how to reduce the amount of existing refugees, not many people have actually thought about how the refugees themselves feel about these recent developments. Not many know what it is like for them to grapple with the difficult choices they’ve had to make; the loved ones they might have had to leave behind, and what it is like for them to feel “identity-less”. Refugee issues were certainly not a topic that might have been frequently debated a few years ago. Even just a few months ago, most of the HongKongers I spoke with were not aware of the existence of refugees. Today, people in Hong Kong are starting to gain interest in refugees; perhaps public awareness has been raised due to a variety of recent governmental debates and media interest on how to settle or treat them. Unfortunately, most of the coverage has been negative. Read our op-ed this week for more on this matter in both Ming Pao (Chinese) and Hong Kong Free Press (English). The refugees I help have come up to me expressing their concerns regarding the hostility they have been feeling as a result of these reports. We have been receiving more enquiries from protection claimants (refugees with a protection claim under the USM) who struggle to understand the numerous new measures announced in the media, such as plans to speed up the USM or the Chief Executive’s comments on Hong Kong possibly withdrawing from the Convention against Torture. They are confused about what criteria will be required to accept their USM claim. While they welcome changes that might speed up processing times, they worry if these may be implemented at the cost of fairness. Many protection claimants therefore have the bitter impression that Hong Kong is doing everything possible to get rid of them, and are distressed about potentially receiving a negative decision. It is not difficult to see where they get these impressions from, particularly considering the recent trends we have been seeing in the rejected claims for protection. For instance, the UNHCR has advised governments not to forcibly return people to certain countries which are considered to be countries of concern because of how unsafe they are. But despite this, Hong Kong has been rejecting protection claims from countries such as Central African Republic – even though it’s downright dangerous for refugees to return there. The constant reports on “bogus refugees” in the Hong Kong media are really having an impact on the morale of the protection claimants that I work with, who feel that they are discredited right from the beginning, giving them absolutely no hope of succeeding at all. They came to Hong Kong to try to escape the horror they had been living through. But while they may be safe from physical danger here, they constantly fear that they are at risk of being returned to the danger in their countries. You simply cannot underestimate the negative impact this has on the mental health of people who are already vulnerable. 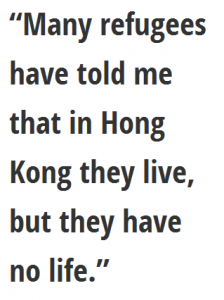 Many refugees have told me that in Hong Kong they live, but they have no life. More and more protection claimants are asking us if the Hong Kong Government is intending to stop accepting all refugees. This may or may not be the government’s intention, but it seems understandable that so many of them feel abandoned and let down. As a caseworker, you do the best you can, but there’s only so much you can do to help claimants have faith in a protection system that feels like it’s working against them. It is reasonable that the Hong Kong Government has a duty to safeguard the interests of Hong Kong, but this does not have to be done at the expense of those seeking protection here. Next week, on February 2, the Legislative Council will be presenting a comprehensive review of the government’s strategy of handling protection claims, which you can watch live on the Legislative Council website. A. Ma volunteers as a Protection Claims Caseworker at Justice Centre Hong Kong. Will we move forward in 2016? On my first day at Justice Centre I remember I was asked what I thought about refugees. After a slight hesitation, I answered, “The media says some are bogus refugees who come to Hong Kong intentionally for economic benefits”. However, the more I researched refugee issues as part of my work at Justice Centre, the more I found out how biased the Hong Kong mainstream media can be in its coverage. “Bogus” (literally meaning “false, not real or not legal”) and “illegal immigrants”, are the words frequently being used to describe refugees who are seeking asylum in Hong Kong. I worry that the effect of labelling refugees as “illegal immigrants” puts them at a distinct disadvantage in the policy-making process; mainly because the other side of the story is largely left untold. The UN Committee against Torture, in their recent concluding observations with recommendations to the Hong Kong Government, expressed concern for the situation faced by refugees here, particularly about the fact that a person has to overstay their visa and become ‘officially “illegal”’ in order to apply for protection. The Committee also continues to urge the Hong Kong Government to seek extension of the Refugee Convention to Hong Kong to offer refugees international standards of protection. Most refugees do not have a choice of where to go when fleeing persecution in their home country. What the public does not know is that many come to Hong Kong on a (legal) visitor’s visa, which ensures them immediate safety, with the intention of applying for asylum once they are here. However, they are often shocked to find out later that Hong Kong is not bound to the Refugee Convention. Additionally, the government-funded humanitarian assistance package is not sufficient to support the livelihood of the refugees, given that they are prohibited from working in Hong Kong, where the cost of living is extremely high. Some of them who cannot afford the rent even live in slums in New Territories where the sanitary conditions are appalling. Regarding social inclusion, refugees may be further marginalised due to their immigration status, ethnicity and language barriers. Many find it difficult to publicly advocate for their own rights, fearing that revealing their identities might endanger their (or their family’s) safety or even affect their protection claim in Hong Kong. In a nutshell, the experience of refugees in Hong Kong sounds inconceivably dehumanising, yet we cannot deny its existence. What can we, young people particularly, do to help refugees? Perhaps the first step to take is to change our mindset by knowing more. For instance, this UNHCR video shows the lives of refugees from Central African Republic, a country which many of Justice Centre’s individual assistance recipients come from. Many people don’t know very much about the events happening in this country, which refugees are fleeing from. Before volunteering with Justice Centre, to put it bluntly, I had a biased understanding towards refugees; at one time I thought these people were not worth the resources that the government had been spending. But my mindset has changed considerably in the three months I’ve volunteered here, from indifference to sympathy, after learning more about the hardships many refugees overcome to reach safety from their home country. Young people can also help by using their knowledge to positively contribute to the dialogue; it is heartbreaking to see insulting comments targeting refugees on social media where it is clear that the netizens usually have no idea of the other side of the stories. We can also reach out to policymakers to advocate for refugees in Hong Kong. Our understanding of these issues makes a difference, as public opinion can be an influential factor that policymakers consider when debating policies on refugee rights. Young people are essential to bringing about change, but all of us need to take a first step to learn about refugees and understand the critical situation that they are facing, both in their home countries and in Hong Kong. The government has been promoting Hong Kong as Asia’s World City, an international melting pot where vibrant people, cultures and ideologies are tolerated and respected. However, such a notion is not reflected in the government policy on the rights of refugees. It is 2016: is the government moving forward to a more tolerant and fair protection system or stepping backward to an unwelcoming and ambivalent one? The answer is held in your hands. Raven is a final year International Relations major at the University of Hong Kong (HKU). She is an intern at Justice Centre through HKU’s Social Science Social Innovation Internship programme. This week, Justice Centre as well as other civil society members had the opportunity to address the Legislative Council Panel on Security (LegCo Panel) in advance of Hong Kong’s periodic review by the UN Committee against Torture in Geneva later this month. The LegCo Panel was a welcome opportunity for long overdue public discussion on the Unified Screening Mechanism (USM), the government’s screening mechanism for asylum claims, and it became apparent that LegCo members shared our concerns; particularly, concerns with the government’s recent negative rhetoric on refugees and with the transparency and standards of fairness. Notably, and on a more positive note, Social Justice Alliance (SJA), a self-led community group formed by graduates of our Voices for Protection Human Rights and Advocacy Traineeship for refugees, also weighed in on the discussion with their experiences of the USM. As a new member of Justice Centre, it excites me that I am part of an organisation that strives to make refugees’ voices heard – and to do so in a way that results in real practical action on a public platform. Since starting as the Justice Centre Fellow last week, I have been familiarising myself with the USM and meeting with some of our beneficiaries who have come to Hong Kong to seek protection. As part of my work here in the legal team, I have been sitting down with beneficiaries to draft testimonies to support their claims; their experiences are often confronting and unimaginable from the comfort of soft couches and mugs of tea at our office. Many of them have fled highly volatile countries, marred by widespread violence and political unrest. Many have experienced acts that are at the very least degrading and inhumane. While it is easy to be empathetic, our role at Justice Centre is to help them navigate the baffling maze that is the USM. However, the concern has been that since its inception, the USM seemed to be designed to confound and dissuade. There was limited public consultation upon its introduction; despite repeated requests, there are no comprehensive statistics or database made publicly available to track its progress; and there is no set of precedents to draw upon for guidance, as redacted decisions under the USM are not published. The lack of transparency aside, what is even more alarming is the rate of rejection of 99.7%, one of the highest in the world. This is rather hard to believe, given that we at Justice Centre are seeing claims for protection from countries with blatant and pervasive human rights abuses. The abysmally low rejection rate raises serious concerns about the underlying fairness and reasonableness of the decision-making process. What surprises me most is the fact that many of the rejections are based not on the credibility of the claimant, but on the grounds that the decision-makers believed there is no risk in their countries of origin (COI). We find it disconcerting to see rejections of claimants from countries such as Central African Republic, Somalia or Yemen, which have been flagged by UNHCR and numerous governments as countries of concern for asylum purposes due to widespread conflict and persecution in those territories. It is also concerning that the rejection letters seem to include COI research that does not correlate to the particular circumstances of the claimant, and reveal an exceptionally high bar for the risk of torture, cruel, degrading or inhumane treatment or punishment (CIDTP) and persecution. This puts into question the reasonableness of decisions, especially when pitched against international standards. This is why we are currently conducting a legal analysis of rejected decisions. Transparency and fairness go to the core of any legitimate and just legal system. Instead, what we have right now places vulnerable people in a system steeped in confusion that focuses on rejection rather than protection. There is a long road ahead before we arrive at a comprehensive, transparent and procedurally fair system for the vulnerable people who come to Hong Kong in search of sanctuary; yet I believe Hong Kong is a society that embraces solidarity and humanity, and I am hopeful we will get there. 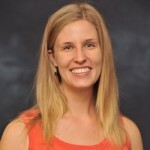 Lynette is the Justice Centre Fellow and the latest addition to our team. Before joining Justice Centre, Lynette worked at Fragomen Worldwide, an international law firm specialising in immigration law, in Australia and Hong Kong. She also worked as a human rights trainer on the Thai-Burma border, where she developed and implemented a curriculum on non-violent social change for young Karenni refugees. 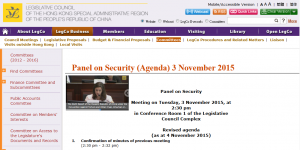 Watch the webcast of the LegCo Panel on Security session here. 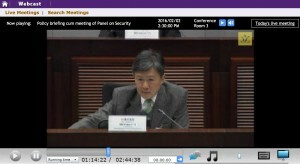 Read Justice Centre’s full speech to the LegCo Panel on Security here. Read Social Justice Alliance’s full submission here. Read Justice Centre’s shadow report to the Committee against Torture here.